The Scientific Study and Experimental Treatment of an Ad Reinhardt Black Painting was a research project and subsequent presentation that grew out of a donation by AXA ART to the Solomon R. Guggenheim Museum and the Museum of Modern Art, New York of a severely damaged monochromatic study by Ad Reinhardt (1913-1967), after it was declared irreparable. What started as the donation of an unsalvageable painting to a museum for research turned into an unprecedented exploration of experimental treatment using laser technology directly on a damaged, historically significant work. Over seven years, the collaborative team of conservators, scientists, curators, and artists carried out a complete physical examination and scientific analysis. The findings of this unusual project were exhibited to great acclaim at the Solomon R. Guggenheim Museum from July to September 2008, followed by a symposium. 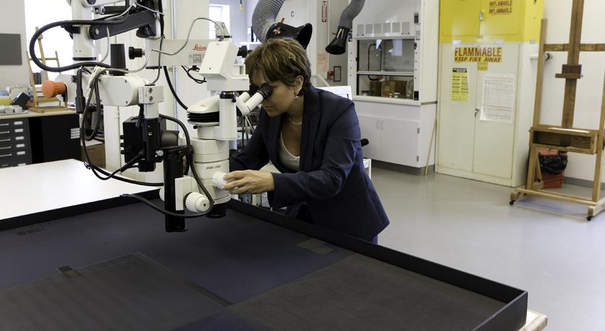 Image: Carol Stringari, Chief Conservator and Deputy Director, Solomon R. Guggenheim Museum. Photo courtesy of David Heald © Solomon R. Guggenheim Foundation.